My series of Game Board Designs that were inspired by the Gee's Bend quilts are shown after the story that I wanted to share with you about the history of Gee's Bend. 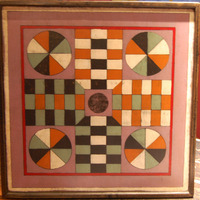 Please scroll down to see the inspiration behind each game board and to read about the original quilt artist. Unfortunately most of the game boards are retired but #9 & #10 are still available. if you would like to be the first to know when a new design is available, please sign up for my newsletter. After reading the book, "The Quilts of Gee's Bend", I have been inspired to create a line of game boards based on the colors and designs that are and were used in the Gee's Bend quilts. The story of Gee's Bend, the quilts and their fabrics and amazing colors are so unique that they remind me of a playful day; children running in the grass barefoot and playing games. Resembling an inland island, Gee's Bend is surrounded on three sides by the Alabama river. The residents ancestors worked the cotton plantations there, first as slaves, then for several generations as tenant farmers... Gee's Bend quilts carry forward an old and proud tradition of textiles made for home and family. They represent only a part of the rich body of African American quilts. But they are in a league by themselves. These quilts stand out for their flair - quilts composed boldly and improvisationally, in geometries that transform recycled work clothes and dresses, feed sacks and fabric remnants. My colors and designs are inspired by the book, titled "The Quilts of Gee's Bend", and all of these pieces will all be Limited Editions. Way long ago I had wanted to be a documentary photographer...I wanted to go to worlds that were unlike mine, to see the differences and the similarities, to try to record these for purely historical purposes...i did not become one after all, for I was shut down purely by the fear of being a young woman in these 'other worlds' in other countries that could be so unsafe for me...we needed yet another generation to pass by us - this new young generation of women who fear nothing, who are not limited to the fact that their choices were limited to secretarial, flight attendants or nurses. Over this time of working on Gee's Bend pieces....what I have actually found, is the 'sameness'...that yes, perhaps we are from different 'worlds' in some instances...but women all over the world seem to be able to take the scraps of their lives, entwined with memories and make them into art...they gather for friendship, this need to be close and this driven need to create beauty....yes, there is a part that is a necessity, warmth, but if that were the only case the time, creativity, the art of it wouldn't have appeared...now as I create pieces I don't think of the differences in our upbringing, our fights, our towns, but I think of the love they had for each other, for their families, and their fight to make things beautiful and to laugh. The video below is a wonderful peek into the women of Gee's Bend, quilting and singing. Beautiful quilt signs have been added throughout the area. How wonderful....to hear their voices sing while you are looking at their work! Thank you "Deep South Magazine" for sharing this video. I do believe that this new game board was not only the most fun but also the most difficult piece in the Gee's Bend Series for me to attempt to create. With more than 15 colors and my deep desire to create a design that mirrors the shirt fabrics that Lucy used in her quilt, I think this is my favorite. I love quilts with plaids and I will admit that I have made 1 or 2 or 3 myself and often used plaids on the backing. 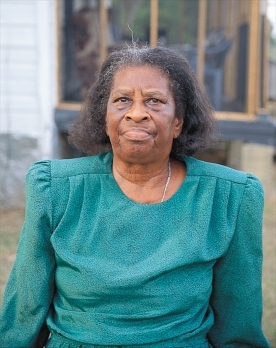 Lucy T. Pettway, known as "Lunky" was born in 1921 and passed in 2004. She was raised and taught quilting from several of Gee's Bend's most serious quiltmakers. She made quilts for more than 70 years, beginning around the age of 12. When she was young she used to go over to Martha Jane's house, her aunt (game board below), and help her quilt. Her family farmed, 14 children altogether, and they would go to school when they could, farming was the priority. "I always had taken me some quilt pieces in the fields when I was working there, and when I knock off work at twelve to eat, I make me a block or so till I go back to the fields. When the field days ended, I went to making quilts most all the time when I wasn't sewing and making clothes for the children to wear." Lunky's first quilt was Lazy Gal when she was 13. Then a Nine Patch and then she began creating string quilts - all made out of old clothes. She was cared for by her Aunt "Arie" (game board above), and loved her dearly. "I love to quilt. I love to piece on them. I love to wash them. I love to look at pretty quilts. I got to make me another one". No matter how many times I go through the Gee's Bend book of quilts and artists, I always seem to pause on page 114. Martha Jane Pettway created a variation piece in a spectacular shade of green. "Housetop" - 9 Block & Half Log Cabin created in 1945 from Corduroy. Born in 1898 and passed 2003, one year after her oldest son Nathan passed away. Martha was married to Little Pettway and they were kind of like leaders for Gee's Bend. During the Depression they persuaded families to participate in the New Deal. They were also among the first to purchase a "Roosevelt" home. They together had over 75 acres, much in the swamp and they grew their own food, cotton, corn peas and sweet potatoes. Martha had 15 children and carried them as she farmed. Martha would take anything she could find and create a quilt out of it. She taught her older girls how to quilt for the families daily use. The new piece is named: Qunnie after the quilter Qunnie Pettway who was born in 1943-2010. 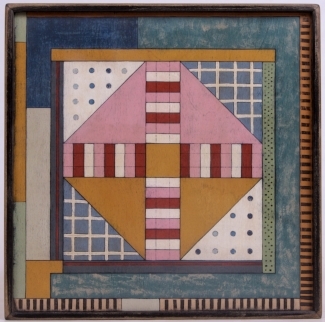 The piece that inspired me was her 'housetop' quilt, circa 1975. In Qunnie's words: ""My mama, Candis Pettway, learned me how to quilt. We made 'Housetops' and quilted them in rows. Af­ter I got married, 1960, I started making pattern quilts. My sister learned me how to piece the “Wedding Ring.” Then I learned to piece a “Chestnut Bud” at Mattie Ross house. Later on I learned to piece the 'Bear Paw,' 'Grandmama’s Dream,' 'Grandmama’s Choice' up to Mrs. Witherspoon’s. For myself­, I like to piece a 'Crazy Z' quilt and strip quilts with the corduroy f­rom the Freedom Quilting Bee. I made eight-point 'Star' quilts f­or other people. When my health went to f­ailing, I stick with simple quilts." The piece that i introduce is based on Arcola Pettway...called Lazy Gal...it was created in 1976...and holds vivid colors of reds, green, blue, soft yellow and browns. "The life of Arcola Pettway (1934-1994), with its farming, child raising, gospel singing, and quiltmaking, was very similar to those of her closest relatives and friends. Her cousin, Leola Pettway, who was raised in the same home with Arcola, remembers their younger days...."
"'My auntie Deborah Young was her mama. You got to ask somebody else about who her daddy were. We growed up together, living with our granddaddy. He was a reverend. We played a lot; couldn't do much in them days but stay home and make up games, or go get water from down to the spring. When us coming up - we was little children - we used to sing together in church, just the two of us. Best thing back then was: went fishing. Set out hook overnight, go back next morning and get something sometime. Auntie Deborah, she teach us about quilts. Teach me first - I was five or six years older than Arcola and I reckon I showed her some. She used to sing in a group, go around to churches; sing with her sisters and my daughter, and I help them out some Sundays. Arcola got married to Joseph. They had a lot of children, I reckon a dozen or more. They farmed, just about like everybody else.'" This piece will be named "Leola", after the designer herself, Leola Pettway. born in 1929 and passed in 2010, quilt circa 1975 corduroy. It is a log cabin-courthouse steps variation local name of bricklayer. "I started out piecing quilts when i was eleven years old. we didn't have nothing to make quilts like folks have now. some old piece of rags, old dresses that was to raggly to wear, that's all. I cut these little blocks with my hands, made me a whole black and white quilt. eleven years old. after I pieced it, my auntie Deborah young teach me to quilt it." As I promised, the new gee's bend board has been created, painted and finished...it was difficult for me to get a good picture of the piece...my camera just didn't want to focus...could it be that it wanted to just dance, which is how i feel when i see this piece? 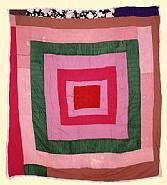 Minnie Sue Coleman, born 1926. design of the quilt was 'pig in a pen' medallion. circa 1970. polyester knit and double knit. 61 x 82". "The creation of a quilt was a respite by comparison with endless other chores. The quilt was a 'cushion', in a very real sense of the word, against elements that invaded their log cabins chinked with mud against the wind. Illness, especially among children, was not a welcome visitor in Gee's Bend, and along with home remedies and castor oil came a pile of quilts to sleep under - protecting oneself, along with the warmth of siblings, against the damp of the Alabama River air. The complexity of these women's lives, woven into a daily experience that included raising children, farming and finally quilting, if reflected in the complexity of their quilt compositions." I do not know how many of you grew up on farms, or your parents or grandparents had farms....it was many generations ago that it was the 'norm', but my husband, clarence, was raised on a farm, a tobacco farm. He had pickin' clothes, school clothes, church clothes and play clothes. He knows the difference in crops, dirt, weather and all the other things that seem so alien to me and my suburban upbringing. My parents were on farms too, and left and never looked back. I remember when I went through my 'romantic' phase of - "lets buy an old farm house and fix it up and have a really large garden"... didn't sound like fun to him, sounded like all the work he had left behind along with all the discomforts... now of course, i'm older, and have watched many documentaries on farm life...and realize the difficult work and life that is often times decided by weather alone. If you haven't already seen the Gee's Bend book, "The Quilts of Gee's Bend", here is a link to their site where you read about their quilts, see patterns or order the above book directly. It was so interesting for me to read about Loretta Pettway, (born 1942), her upbringing, creativity and story of her life. As i dissected her story, i dissected her works of art. I was inspired to create two designs inspired by her quilts., "Loretta" and "Work Clothes". "I made all my quilts out of old shirts and dress tails and britches legs. I couldn't never get no good fabric to make quilts, so I had to get the best of the old clothes my peoples wore or old clothes I got from other peoples. I get the best of the shirt sleeves or whatever part of the pants wasn't wore out-like the back of the pants legs, 'cause the knees mostly be wore out. (We pick the cotton on our knees). Some people would give me old clothes, and some of them my kids couldn't wear, and I would tear them up and make quilts. I didn't think I was too good at cutting out. If I could have got with friends to get me on the right track, maybe. But I just didn't have friends, so I had to piece up things the way I could see to do. I ain't never made a real pattern. I just made what my grandmama had made back in those days - "Bricklayer, Housetop" and stuff. God have brought me from a mighty long ways. I prayed to the Lord when I was growing up that it won't be this way always. I am looking for a brighter day, a better day. And I say, "Lord, let my last days be my best day," and he have fulfilled it. When I was married, I didn't have money. My husband would give me fifty cents. I get my own check now. My daughter had to show me what a twenty-dollar bill was when I was fifty years old. I can remember working a whole day in the fields and getting twenty cents. I used to work all day and when night come I was sick all night. I couldn't sleep and didn't have no appetite to eat, but I can thanks the Lord now and say that he has reached way down and picked me up, made my life better. I have food, money, a roof over my head, my health and strength. If I leave today, he have fulfilled the dreams that I ask him for down through the years. And my last days will be my best days. This excerpt if from the book titled, "The Quilts of Gee's Bend", Tonwood Books, Atlanta. A touching story for me to read for so many reasons. A woman making something beautiful, a treasure, out of so little. A woman with faith, dreams and hope. I don't think I will ever be as strong as Loretta Pettway. The original inspiration for this design appears in the book, "The Gee's Bend Quilts", by Tinwood Books, page 163. 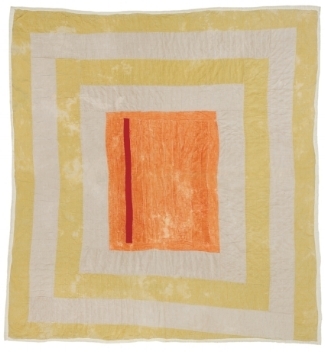 Gloria Hoppins, born 1955 created this quilt, "Housetop", circa 1975. Corduroy (Sears). 91" x 88". Gloria Hoppins is Linda Pettway's daughter. Excerpt from book: "A coincidence gave birth to a new genre in American art, the "Sears corduroy" quilt. In 1972 Sears awarded Rehoboth's Freedom Quilting Bee a contract to manufacture corduroy pillow shams. Late that year, the bee began receiving bolts of raw material, some of which quickly found its way outside and into local hands and houses. Over thenext two decades the shams became the bee's lifeblood (the corduroy was not used for its quilts), while the unused orleftover fabric became locally abundant for personal uses as it was taken home, given away traded or sold for a pittance. The surplus spread the corduroy quilt style from the neighborhood of the bee down to the river at Gee's Bend." Not much is said about Gloria Hoppins being one of the younger ones I suppose. Most of the mentions of her name are with regard to her mother and grandmother. "One of Gee's Bend's foremost artistic lineages consists of serveral Carson sisters - Aolar Mosely, Louella Pettway and Virginia Pettway amonth them - and their extended families, including Virgini's daughter, Linday Pettway and Linda's daughters, Gloria Hoppins and Lucy Witherspoon, who both are still in gee's bend. Gloria is also said to be part of the Ye Shall Know The Truth Baptist Church Choir.